Laxolo is the biggest hamlet of Brembilla, it is situated on a large plateau 500 metres above sea-level. Nowadays it is mainly a centre of small factories, but it still preserves some peculiar features of the countryside life of the past, especially in some areas like Torre, Camuzzocco, Cabonadino, Caremondi, Carbolom and Fornace. According to Professor Angelo Leidi – doctor and philosopher, ex-director of the Civic Library in Bergamo, the place-name Laxolo derives either from the German word lasch (poor and steep pasture) or the word lachesuhle meaning puddle, quagmire. Laxolo was likely to be that way some centuries ago, when its concave and almost flat bottom was used to collect water coming from the top. However, it is not possibile to say that there was a real lake, from which the word lacus solus – solitary lake - would be derived, and then the place-name Laxolo. Besides, it is worth noting that the word lacus is feminine in Latin. According to the ex-parish priest Ugo Dal Buono, the name, instead, derives from the Latin words laxus (large,wide) and solum (ground, soil, place), then contracting into Laxolum in the course of time. In his opinion, this hypothesis describes Laxolo better, as it is a large and wide place compared to the rest of Brembilla Valley, which is narrow and ragged. His idea seems to be confirmed by a very ancient bronze coin weighing 22 grammes, whose back side represents the effigy of the Roman Emperor Domiziano, which was found long ago by Gianpietro Moretti, while he was rummaging in the rubble on the right side of torrent Brembilla. We could, therefore, assume that a Roman soldier arrived in Brembilla Valley for an inspection, lost this coin and his fellow-soldiers spontaneously chose this name in Latin, just like what happened for a small hamlet in Sorisole, which has the same name. In the past centuries, wheat, corn, rye and all other common crops necessary to subsistence were grown in the lands of Laxolo. Among its inhabitants, there were some influential families of landowners, whose gains were due to the intense exploitation of the territory. According to our grandparents and fathers, as the soil was entirely cultivated, the fodder was not available on the spot, but it was gained in the wide patches of pasture in the undergrowth of Corna Marcia. Paths, streams, woods and pasture on that mountain were so clean that it was impossibile to get lost. One of the most peculiar areas of Laxolo is the small area named la Torre (the tower), situated on a hill, in a very good dominant position. La Torre was, in the past, a strategic key point for the powerful family Carminati (Còdega). Some scholars, in fact, consider it as the Eminent house, from which warnings in case of sacks by bandits or dangers for all their properties came. The buildings show the rustic architectonic style typical of the sixteenth century, some walls are still perfect nowadays. An important evidence of the age of this area can be found in the adjacent stables where the dates '1523' e 'AD 19 AP 1612' are engraved. In the surroundings of the 'Pàlazz' (palace) you can admire the beautiful seventeenth-century Cappellania, erected in 1640 from Carminati family (Còdega) and enlarged in 1728 by the parish priest Bernardino Rota. In 1830 22 inhabitants belonging to 4 big families lived here: Musitelli, Pesenti (Lupo), Pesenti (Canoa) and Pellegrinelli. Near the current house of the Pesenti, you can still notice an old rock engraved in the middle. The farm-house of Carbolom is the most original and peculiar area. It is situated on a small hill near Corna Marcia, in a strategic key position, and it was the official residence of the Carminati (Còdega). The family settled there after the expulsion of the Brembillesi (native people of Brembilla) in 1443 by the Republic of Venice. In the area of Carbolom, in fact, some elements which are not closely connected to farming are present. 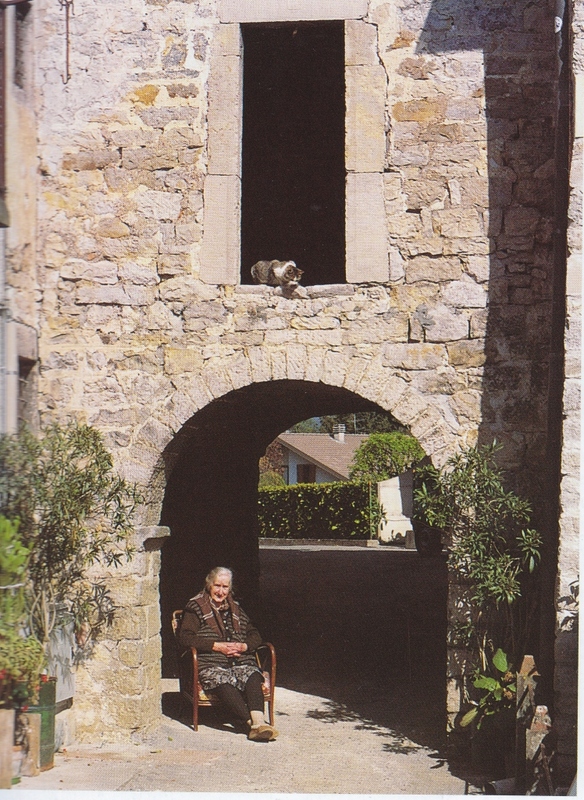 At the entrance of the this small village, there is a wide garden before the town walls, with the main door facing the mule-track, in a mosaic of stones from Imagna Valley and loop-holes. 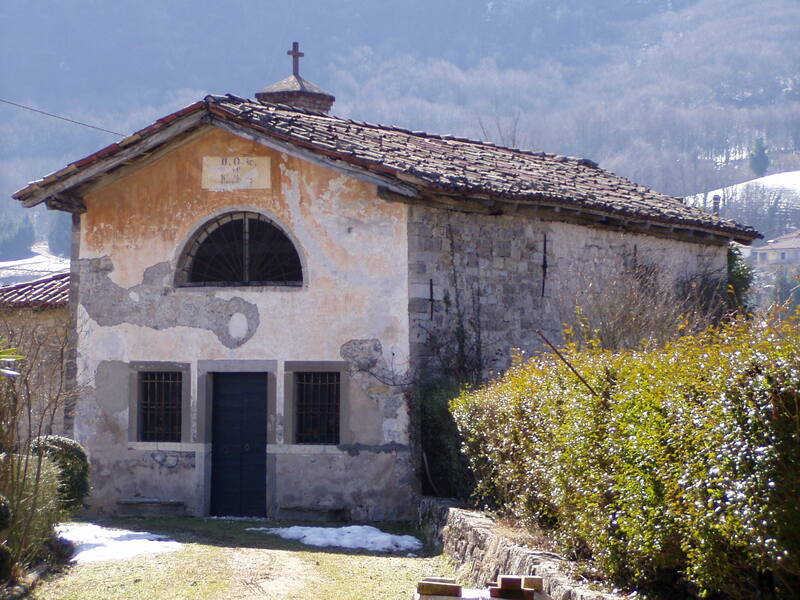 Inside, you can find the first small court yard through which you can go to the spinning-mill, where most cocoons of the small villages of Laxolo were produced. Besides, you can also find the so-called 'Mudera' (place where the birds of the family were kept). On this subject, we remind you that the Carminati 'Còdega' were very fond of hunting and owned many shoooting-boxes in the valley; next to their house, in the area named Fornace, they also owned a stable for horses. The second courtyard leads to the huge house itself, parallel to the walls. Nowadays the various houses are being restored. On a small steeple on the roof, you can still see a bell, which used to be a call or a sign of danger. The main door at the entrance has an iron door-beater that many peasants used to beat in order to ask for lands to rent or favours. The Carminati family were also very influential economically: they owned lots of lands, areas, places in Laxolo, but also in Brembilla and the valley. In addition, they played an important political role in the administration of these places, being the reference point both for the government in Milan and for the doge in Venice. In the northern part of the house, there was an underground ice-house reachable only walking through a subway. Near Carbolom you can see Cabonadino. The area, which was probably named after the first family settling here, presumably dates back to the sixteenth century. Evidence of it would be the type of grille of a window near the subway. The farming architecture of the buildings shows different features compared to the traditional peasant house of Brembilla Valley. In fact , the usual outdoor stairs with the traditional wooden balconies are indoor here, placed at the last floor and protected by a sloping roof. The last floor of the houses on the right of the subway has no facade, but has a series of archs and columns that support the big wooden beam of the last floor. The other two buildings, of an unusually big size, display the same features. We could thus assume it was a small monastery. In 1830 40 people belonging to six families lived in Cabonadino: Gervasoni (Bagaìna), Carminati (Berto), Salvi (Candaro), Gervasoni, Gotti, Moretti. In the recent history of the area, the tavern of Gervasoni (Luigiù) is worth remembering, as it was a meeting point on the way to Brembilla. 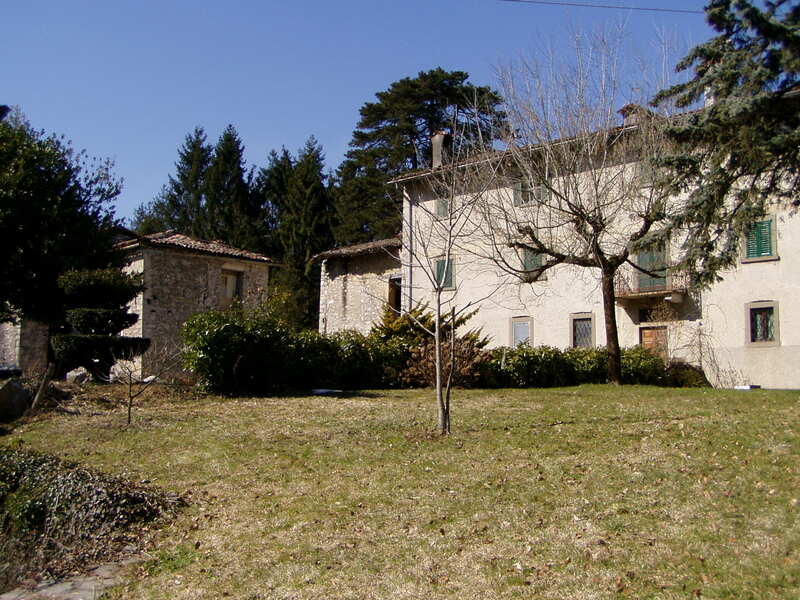 Near Carbolom and Ca' Bonadino, you can admire the small old centre of Camuzzocco. The building of this area could date back to the half of sixteenth century too, but its name was already mentioned in the episcopal census in Bergamo in 1312 under the name of 'Mazòchis'. Camuzzocco was certainly the most populous peasant centre in Laxolo. In 1830 42 people belonging to ten families lived there: Rocchi (Scetù), Pesenti (Sponda), Pesenti “Stèca”, Musitelli (Poanca), Gervasoni, Moretti, Rocchi (Grisù), Salvi (Scarpola), Gervasoni, Gervasoni (Triunfì), Gervasoni. 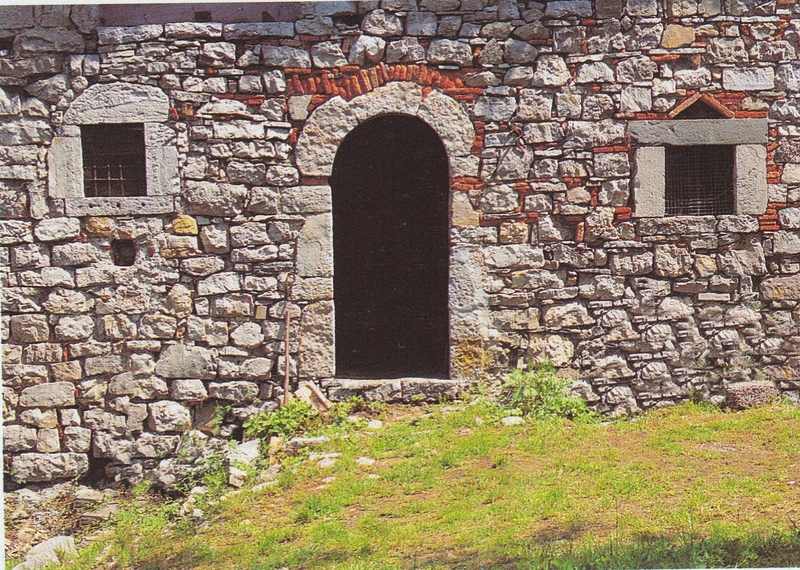 In 1719 the Carminati family (Còdega) built a spacious stable above the spring, near Ca' Muzzocco, which was used by the different families who worked for them. The stable, created for the conservation and transformation of milk, was equipped with two tanks with water and, thanks to its underground position, it enjoyed a fresh temperature ideal for any activity in summer; unfortunately the stable has been recently demolished. In the south of Carbolom, you can visit the area of Caremondi, on a sunny position with a fine view to S. Antonio and Camorone. It seems to be very old, it was in fact mentioned in the census of Bishop Cipriano in 1312, when the inhabitants had to pay taxes to rent lands. The buildings belong to the sixteenth century style, as we can assume from the wonderful subway full of archs through which you can access the old part of the area, where you can see three well-restored houses. On the portal of a house very close to the subway, you can still see the intact date '1561’, engraved on a window. The structure of the house is organized on 3 floors, with interior wooden stairs and a flooring that ranges from the stone blocks of the first floor to the bricks of the second. In the room over the arcade, there was a big fireplace and a stone sink. In 1830 this area was inhabited by 3 peasant families: Pesenti and two Musitelli families (Barlù).